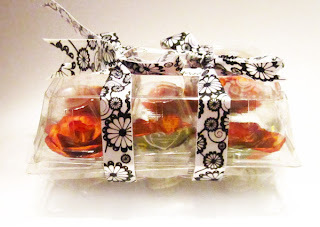 Give a plastic egg packaging a second life by letting it house pretty paper flowers. In this case: half-a-dozen green and orange paper roses. Use them to cheer up a small vase, to adorn gift boxes, as bookmarks, as napkin rings or anything else you can think of. The package also makes a charming gift in itself. See my pink paper roses in an egg box, too.